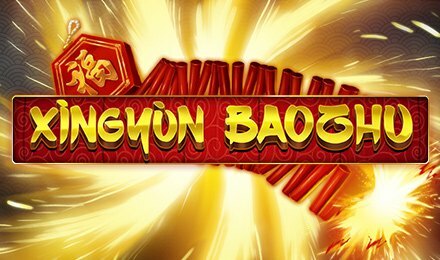 Xingyun Baozhu slots is a 5 reels and 25 paylines slot game that consists of amazing and rewarding bonus rounds! Powered by Eyecon, you can play this slot game at the most popular casino - Vegas Spins via mobile, desktop or tablet. Enjoy the irradiated slot grid against the black background, where symbols will land to trigger big wins. You will find symbols like Dragons, Firecrackers, Gold Coins, Lanterns, Money Wallets and high card symbols like A, K, Q, J and 9, on the reels of this online slot game. Your aim on this interesting slot game is to form winning combinations from left to right of the reels on active paylines. The Autoplay option facilitates your gameplay, as it allows you to choose from 10, 20, 50 or 100 auto spins. Amount of Paylines Selection: Select from 1 to 25 paylines to play on. Coin Values: Bet amounts range from £0.01, £0.02, £0.03, £ 0.04, £0.05, £0.06, £0.08, £0.10, £0.15, £0.20, £0.30, £0.40 and £0.50. The Wild symbol of the game is the firecracker and substitutes all symbols except the scatter symbol. When the wild lands on reels 1, 3 and 5 within a winning combination, all wins are trebled. The scatter is the Dragon symbol, which triggers the bonus round of the game. Trigger the Free Games Feature by landing three, four or five of the Dragon symbol anywhere on the reels. Correspondingly, you will be awarded with 15, 20 or 25 free games. Once activated, cracker symbols will expand to cover the reels, and will increase your winning potential. This feature can be triggered up to 15 times upon landing more scatter symbols during the play of the feature.